So you've got your IG-worthy OOTDs ready and the nice gifts perfectly wrapped for your "monito" or "monita". But are you ready to flaunt your holiday-inspired hairstyle? The heat and humidity brought by extreme weather conditions here in the Philippines though isn't really ideal for your locks making it appear flat and sweaty. Plus, our tropical climate makes it easy to dry out the hair and make it more fragile. Surprisingly, some hair products do more harm than good depending on their chemical contents. From shampoo to conditioner and hair treatment, down to styling goods to groom it to your liking, their harsh synthetic materials jeopardise the natural oil and luster of your mane. As they say, you are what you eat. But did you know that your could eat your way to get a fabulous crowning glory? Your diet must consist of the correct balance of vitamins and minerals to supply hair with all that it needs to become shiny and strong. Practice self discipline and avoid overindulging especially in gastronomic feasts which are widespread this time of the year. Be careful on what you take in and keep in mind that it's also what feeds your 'do. Another tip to keep your tresses looking good is to prevent being stressed. Never put pressure on yourself just to please everyone. Just take it easy, let your hair down and party all night long. In this time of gratitude, NOVUHAIR makes everyday "a good hair day" for its valued patrons with its Christmas and Year-End Promo. 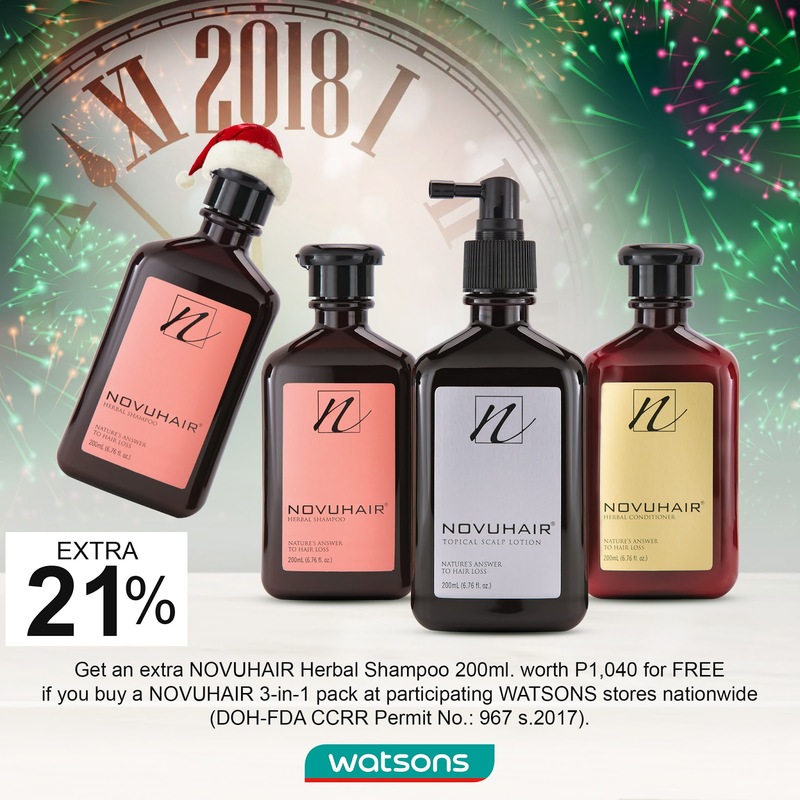 Get an extra NOVUHAIR Herbal Shampoo in 200ml worth P1,040 for FREE if you buy a NOVUHAIR 3-in-1 pack at participating WATSONS stores nationwide (DOH-FDA CCRR Permit No. : 967 s. 2017). It's a good deal since it is packed with 19 natural ingredients -- mostly standardized herbal extracts, essential oils and co-factor nutrients --- NOVUHAIR Topical Scalp Lotion does not only help prevent the hair fall malady, but also aids in stimulating hair growth. NOVUHAIR helps prevent hair loss, improve overall appearance, promote nourishment and rejuvenation. It is clinically-tested and proven safe and effective. Choose the best with this Christmas and Year-End promo. Whether it's a luxury gift for your loved ones, or a self-indulgent treat for you, NOVUHAIR has the perfect gift to inspire and keep you party-ready this Holiday season, while providing you with the ultimate styling result. Great Argan Sale Year 2 Happening on Nailaholics! The weather this season is so unpredictable, sometimes it swings from sunny and humid to cold and wet in minutes. Not good as it dries out the skin and frizzes up the hair. One of the things I've learned working as an intern in a top local beauty company is that Argan oil is AMAZING. 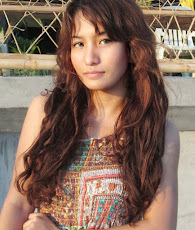 I've personally tested a bunch of product with Argan oil and it consistently did well to revive my very damaged hair. Lately, I have found out that it's not only good for the hair but it also does wonders to your skin! - It's gathered from trees that grow in the southern region of Morocco. - Argan oil is a rich blend of antioxidants, vitamin A and E, polyunsaturated fat, and essential fatty acid. - It’s literally food for hair and skin. It eases inflammation, and gives it a boost of moisture from within that lends itself to an inner glow—the hallmark of healthy skin. What's so nice about Argan oil is it's a versatile product, you could get all its benefits by just mixing a few drops of into your trusty, go-to beauty products or by directly applying it onto your skin. I've even seen a lot of DIY home remedies uses online with this product. No wonder it's dubbed as THE miracle oil! 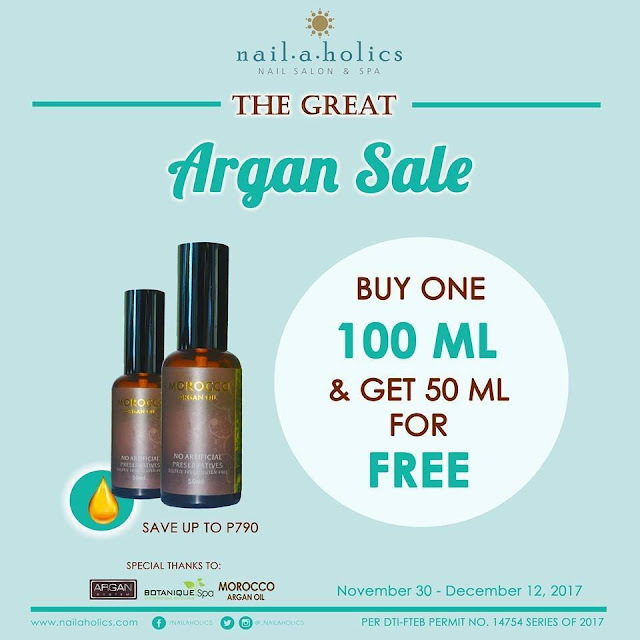 Since it's the season of giving, I'm letting you in on another insider tip: you can get a free 50 ml bottle for every purchase of one 100 ml Argan Oil bottle at any Nailaholics Nail Salon and Spa branch. Perfect for the holidays! Their 100 ml Argan oil bottle is regularly priced at Php 1,390. Now you get to take home more with the Great Argan Sale, giving you a savings of Php 790 which is the original price of your free 50 ml Argan oil bottle. Here's the catch! This exclusive promotion runs only from November 28 to Dec 12, 2017, so you better hurry! It’s a small price to pay for a product that can serve as your night time moisturizer, a skin toner, makeup remover, whole body moiturizer, leave-in hair conditioner and can also be a cure for acne, stretchmarks and razor bumps and burns. For more information on Nailaholics Nail Salon and Spa's promos, you may visit their website at www.nailaholics.com. Or follow their Facebook Page at Nailaholics Nail Salon and Spa, Twitter @_nailaholics and Instagram @_nailaholics. One of the perks of living in the Philippines is having endless access to the sun all year-round. However, it has its disadvantages too.. When you have the choice to head to the beach or pool any time of the year, you're expected to maintain a smooth and flawless Victoria's Secret body constantly when you slip into a bikini. It's difficult and exhausting keep up and to fit in with others expectations of beauty. Not everyone is blessed with fuzz-free skin. Here's a good news for the ladies in the North, this hairy issue can certainly be sorted out by a quick appointment to your nearest waxing salon no matter what season. At Hey Sugar Waxing Salon, they make all-natural and 100% sugar grooming options accessible to clients of all shapes and sizes. 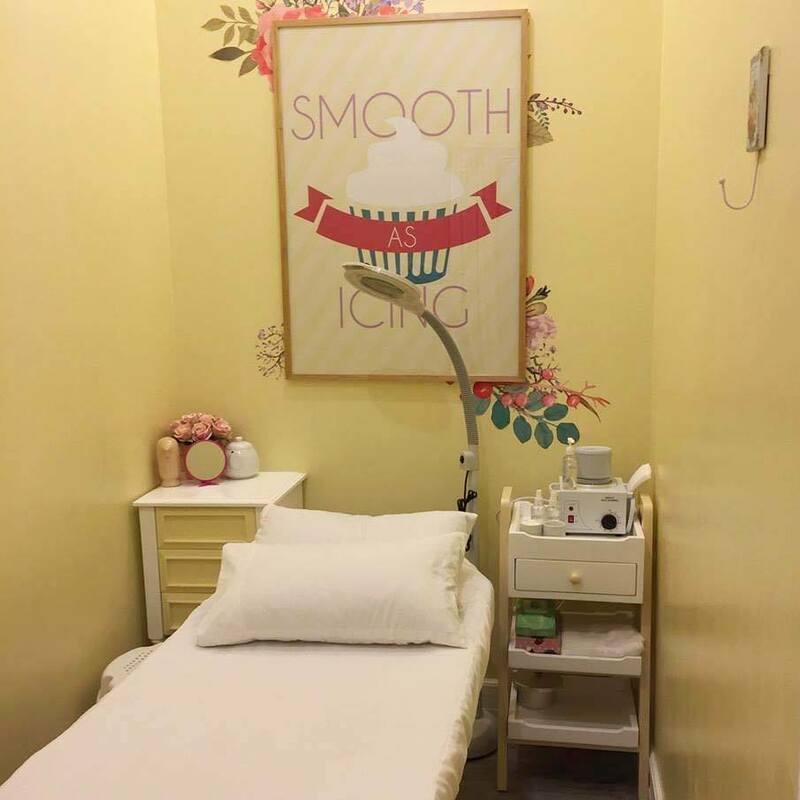 They use 100% naturally hypoallergenic sugar wax that minimizes side effects such as allergic reactions and chemical irritations caused by traditional wax - a gentler but no less effective way to keep your skin smooth and hair-free. Giving the clients the much needed TLC that they need while making sure they also feel fabulous about themselves as well. Another reason to book your appointment is Hey Sugar's interiors are so IG worthy. Ever corner looks so warm, inviting and discreet. The place is ideal for the sensitive beauty services that the customer will be getting since it so clean there and the materials they use are sterilized ensuring that perfect pampering moment. Let your worries disappear and rest easy, knowing that you're in the hands of expert aestheticians who are trained to deliver only the best results. 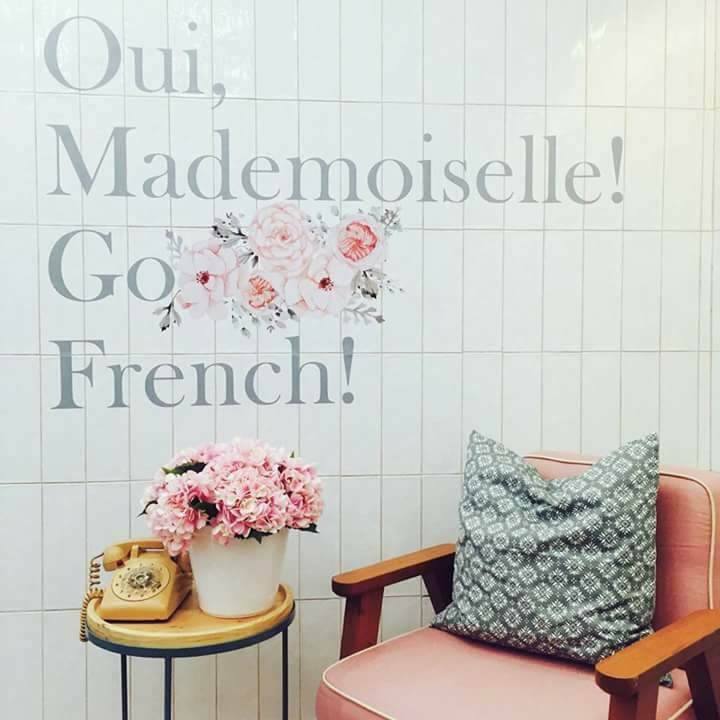 For newbies, this means you can easily ask your aesthetician any questions about the process and advantages of sugar waxing and get a clear answer; for veterans, you know you will step out of your appointment knowing there's no other place that can give you the same results using all-organic hair removal methods. Want some sugar? 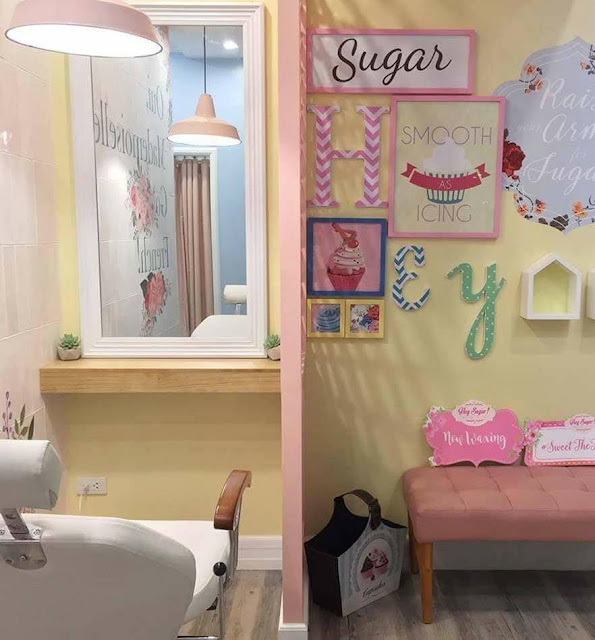 Head on to Hey Sugar, the all-natural waxing destination now open at Robinsons Galleria! For more information on Hey Sugar's services and nearest branches. Follow their Facebook Page heysugarwaxingph, Twitter heysugar_waxing and Instagram heysugar_waxingsalon. 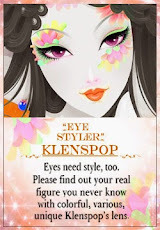 Or you may call them for bookings at 940-9592 or text 09366420530.